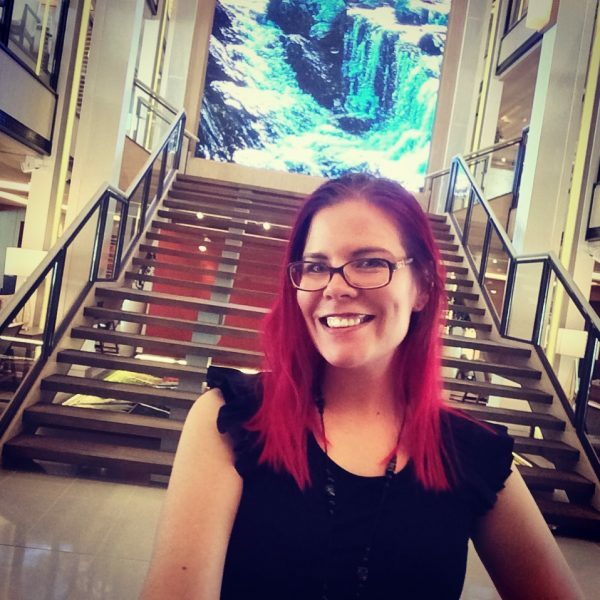 I was rather excited recently to be offered an opportunity to visit the beautiful Viking Sea. 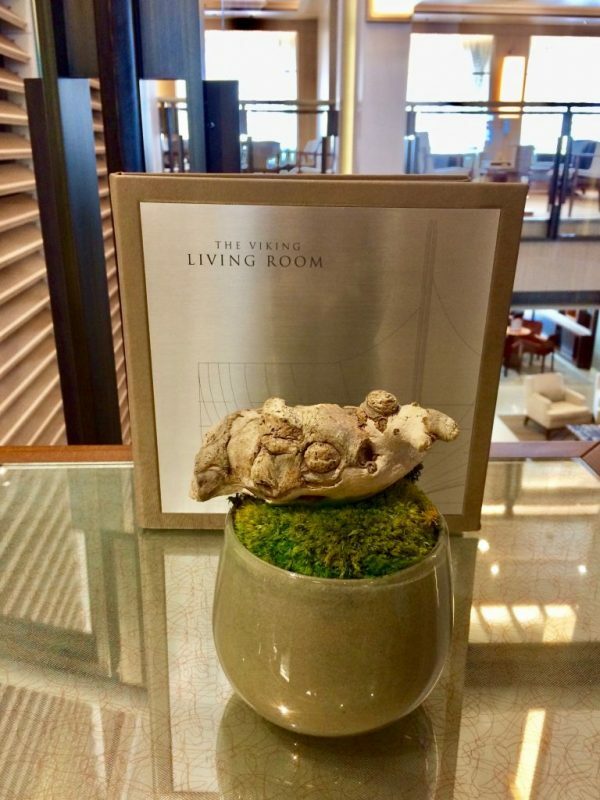 Me being a Nordic soul planted in the UK, I have always been drawn to the Scandinavian design and interiors on the Viking Ocean Cruises fleet. I may have left my former lair for a new life & love in Alba, but I haven’t learned to appreciate traditional British, or American, interiors. 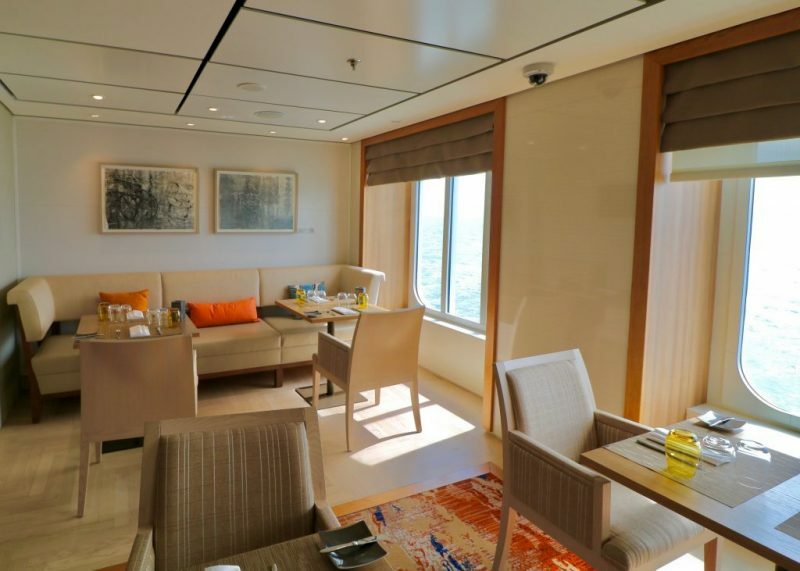 But to me, the airy Scandinavian cool of the Viking Ocean cruises fleet feels homely, almost. 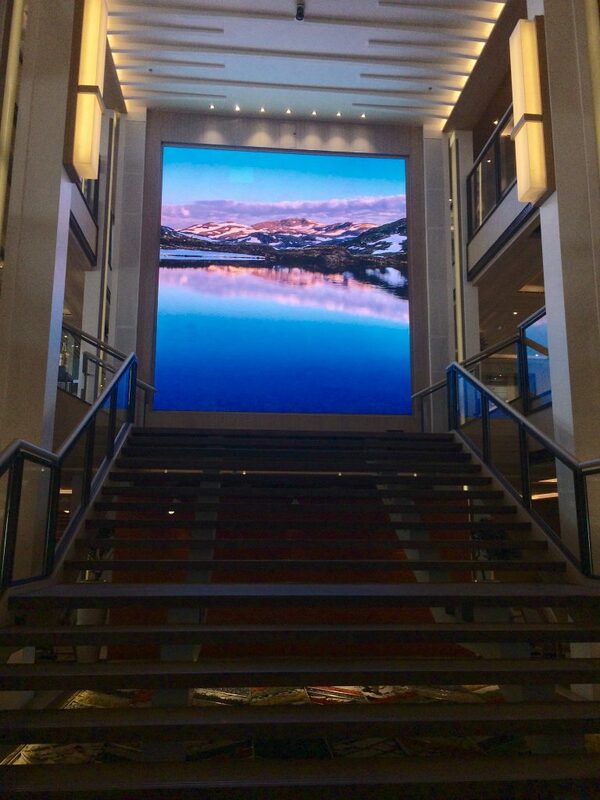 I hope my photos can express why I loved my day onboard the stunning Viking Sea and why I think you will love her too. I mean, why wouldn’t you? She’s a delight: small but spacious, arty but cosy and always impeccably dressed. 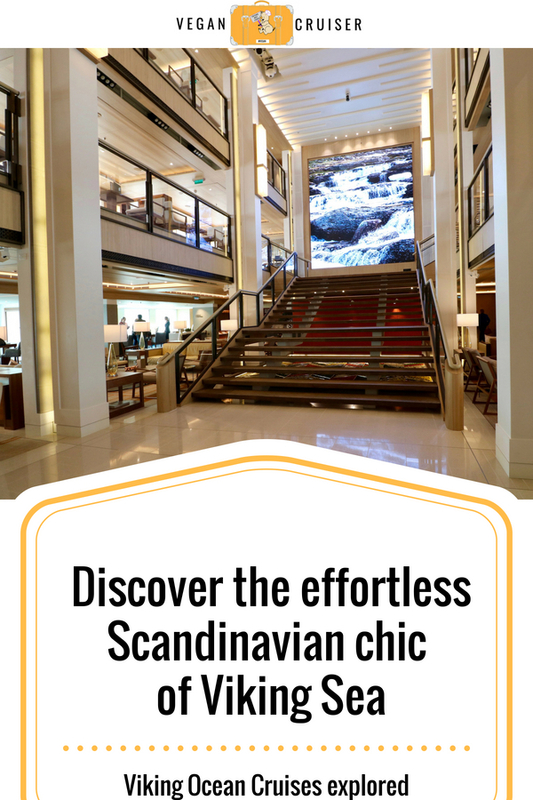 Are you ready to wooed by her Norwegian charms? 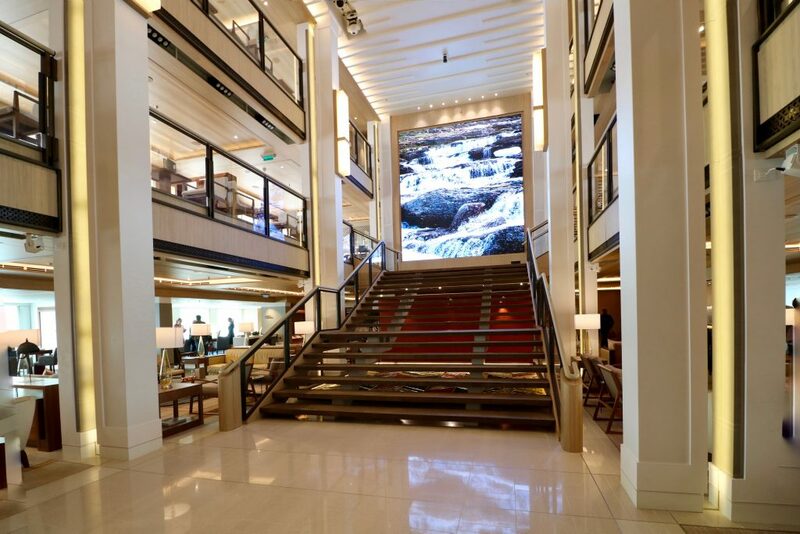 You enter the ship via deck 0 and as you take the stairs (or lift) to deck one, you will find yourself in the stunning three-story atrium, a light and airy welcoming space Viking Cruises have named The Living Room. Such an apt name for this cosy, but modern living area that does indeed look like a trendy Scandinavian living space. The seating options around the atrium comprise of various contemporary designer pieces, mostly in pale wood and muted colours. Earthy light grays and whites dominate the soft furnishings. The flooring is accented with warm orange tones and marine blues. 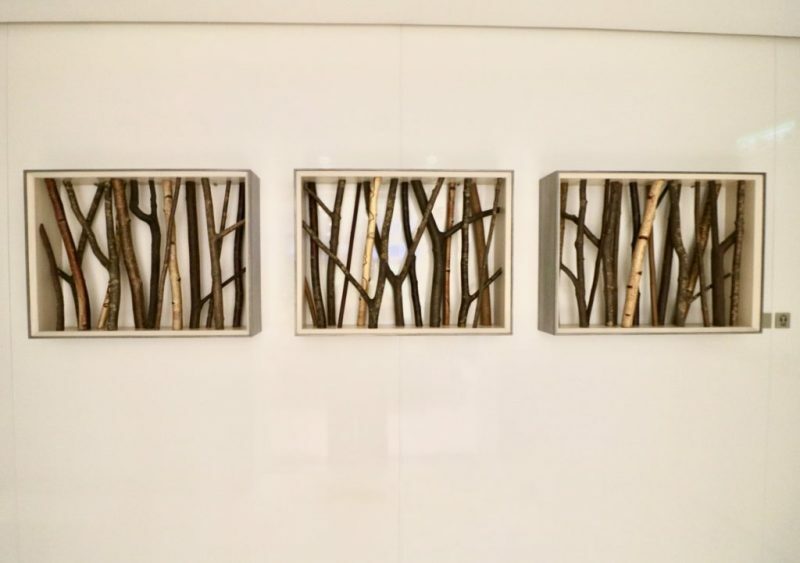 The understated, beautiful pieces of furniture are further embellished by pieces of Nordic art on display. 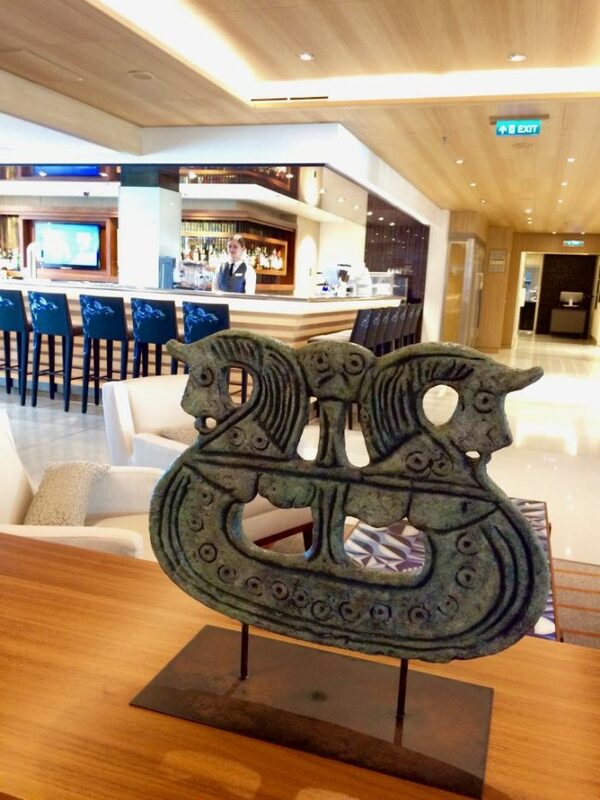 There also are ornamental pieces of actual Viking history on show to represent the home nation of this new brand. 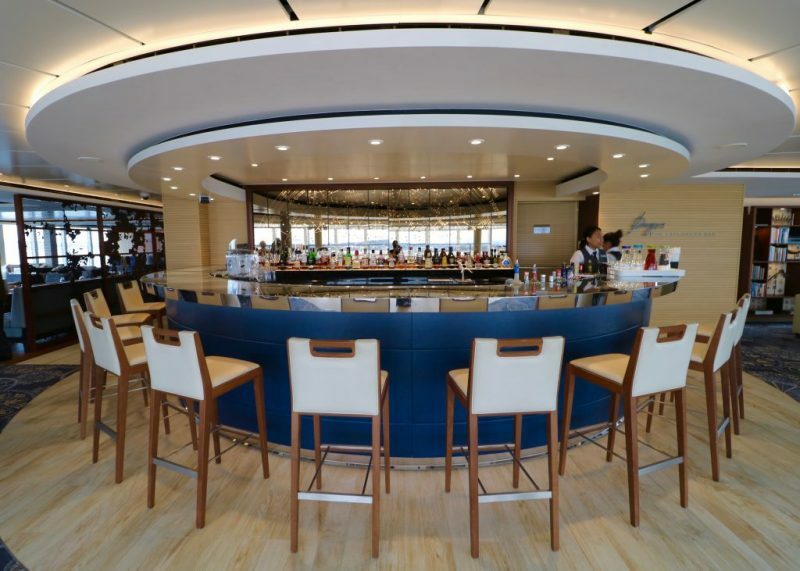 At starboard side you’ll find the elegant Living Room bar for drinks and specialty coffees. 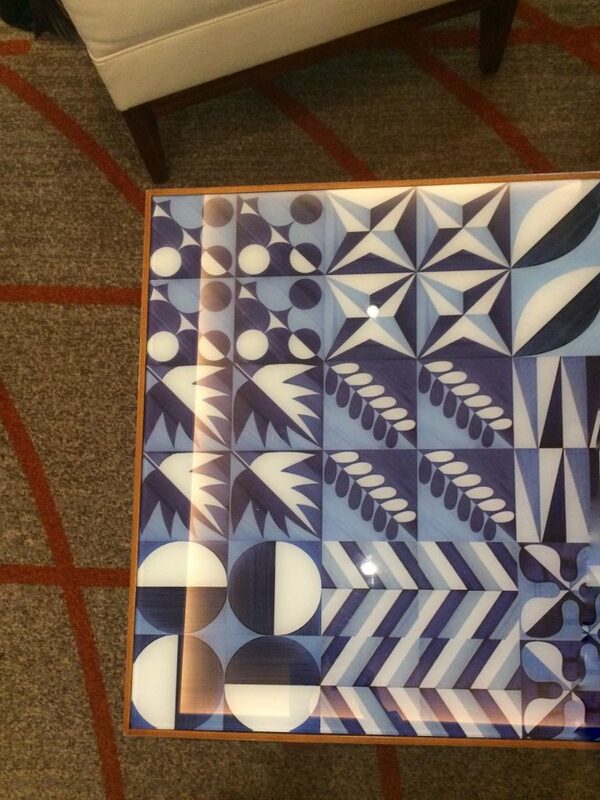 The blue geometrical tile-effect coffee table here was my favourite piece of furniture I could spot in the all of the Living Room. The beautiful library space is at the other end of the Living Room, a gorgeous corner with comfortable reading chairs accompanying a selection of curated readings and art. This is not a stuffy, boring library or a games room, but a luxurious reading nook. 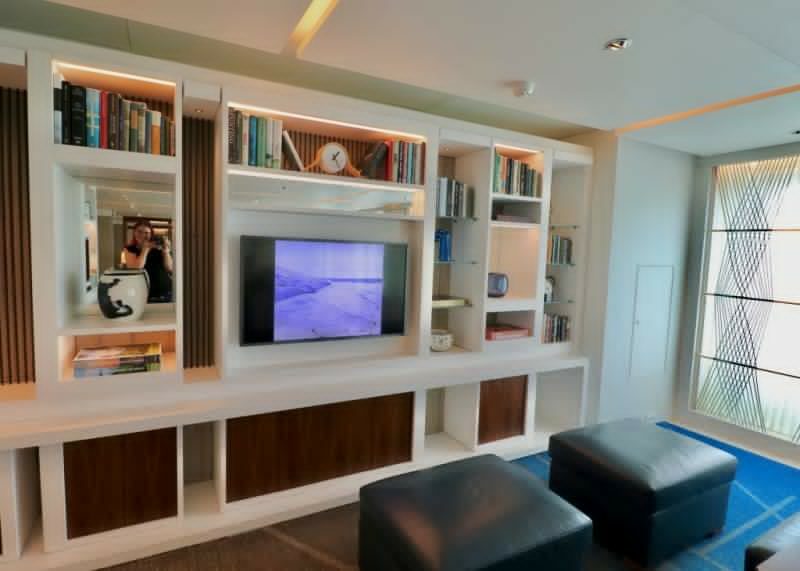 A guest services desk can be found on the port side of the Living Room. 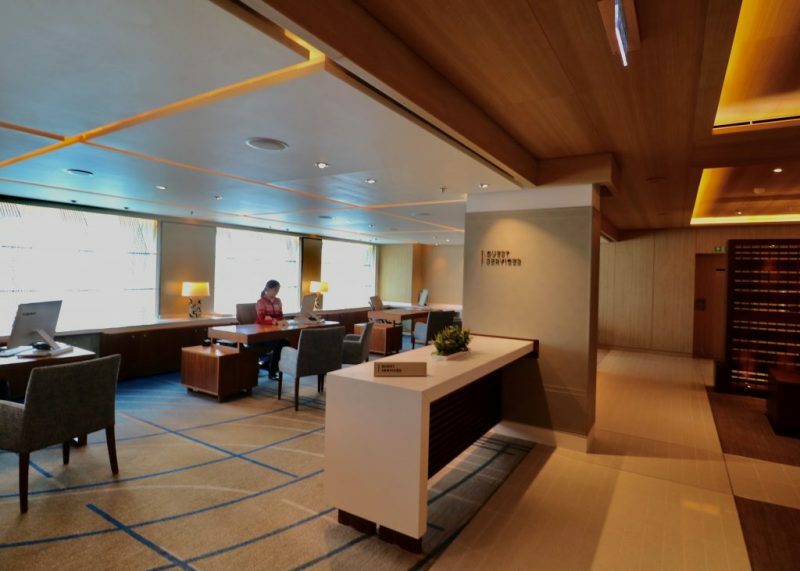 For once the name is descriptive, it is just that, a selection of desks and chairs offering a much more personalised service than standing at a standard reception desk as you would on other ships. At the centre of the Living Room is a bright, wide open space that hosts a Steinway grand piano. Opposite the open space is a staircase leading up to the deck above. This staircase draws your gaze up to a landing that has an eye-catching large screen spanning the height of both decks two and three. It hosts an ever-changing display of scenic Norwegian nature. You will find that even the space underneath the Living Room stairs is utilised. 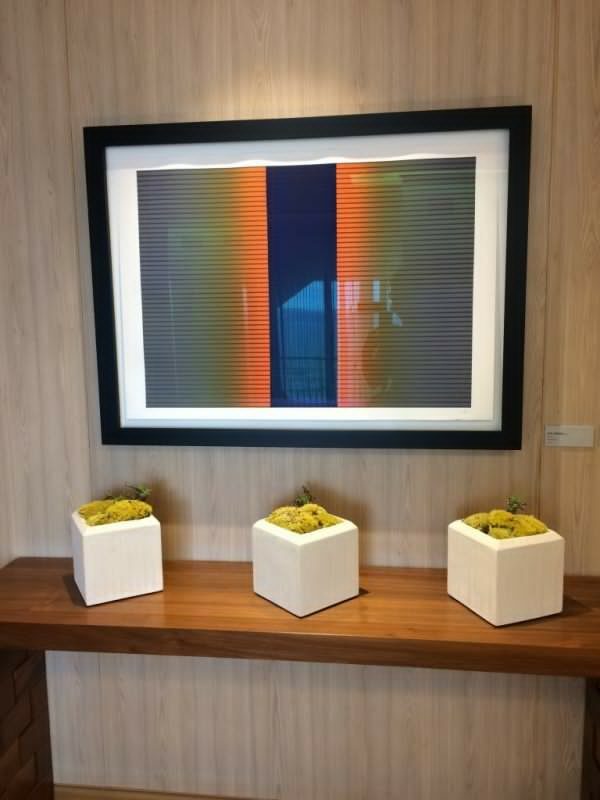 It hosts another piece of art. 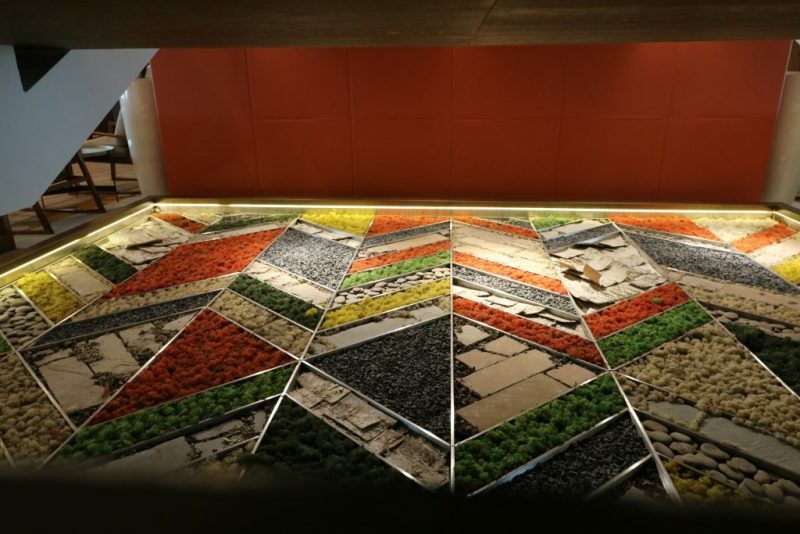 This consists of shapes produced with coloured lichen, wood and stone from Norway to represent the country’s nature and its colours. 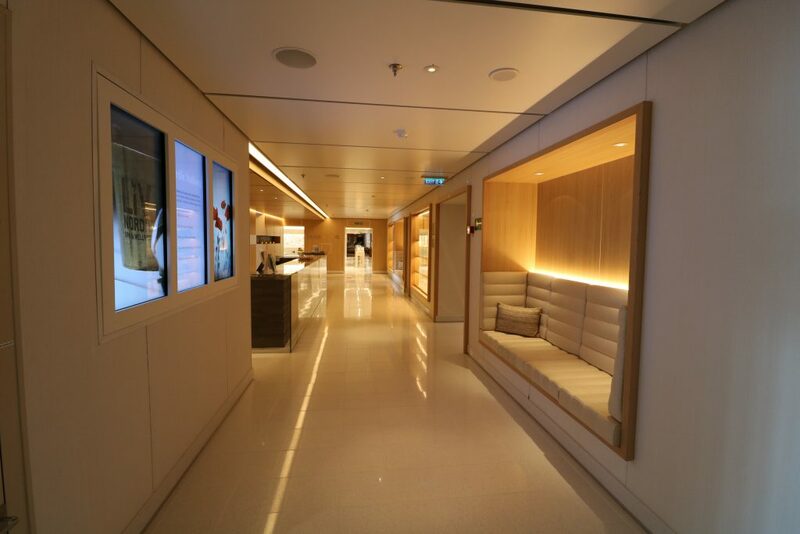 But before we head upstairs for further highlights, deck one also offers a stunning salon, and a small fitness centre to those wanting a workout. Four laps of the wrap-around outdoor promenade deck (on deck 2) will also add up to a mile. 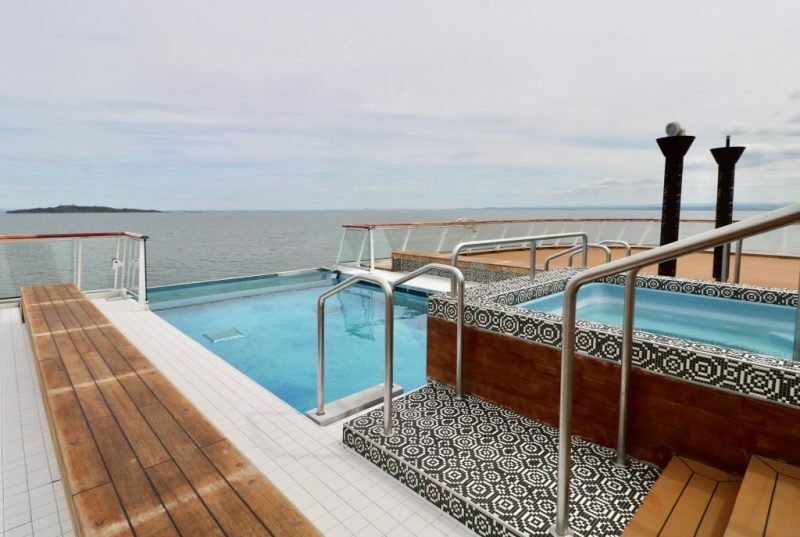 Further forward space on deck one is taken by the calm Liv Nordic spa. 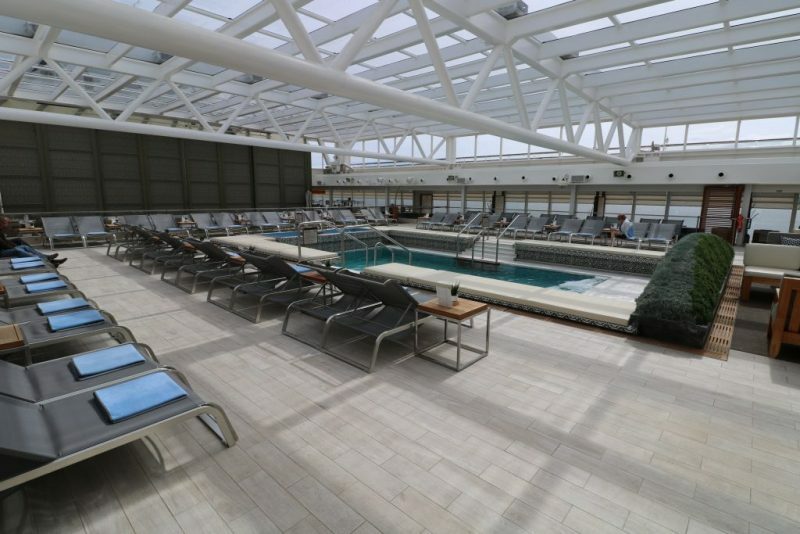 Unlike on most other ships, access to the spa facilities is free on Viking! 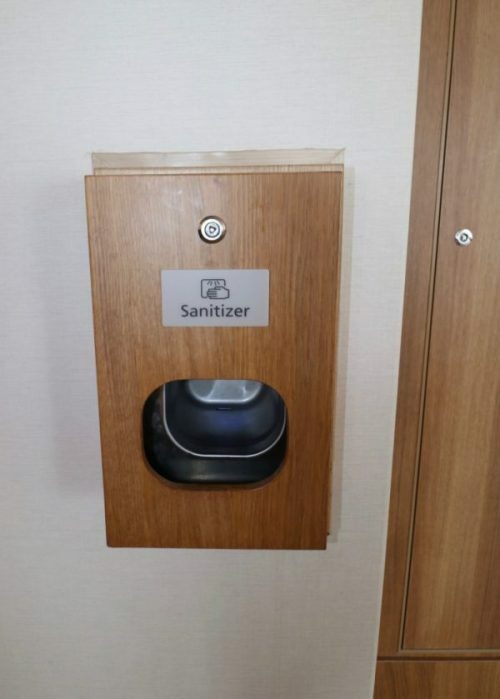 It’s included on your cruise fare, and you only pay for treatments if you opt for any. 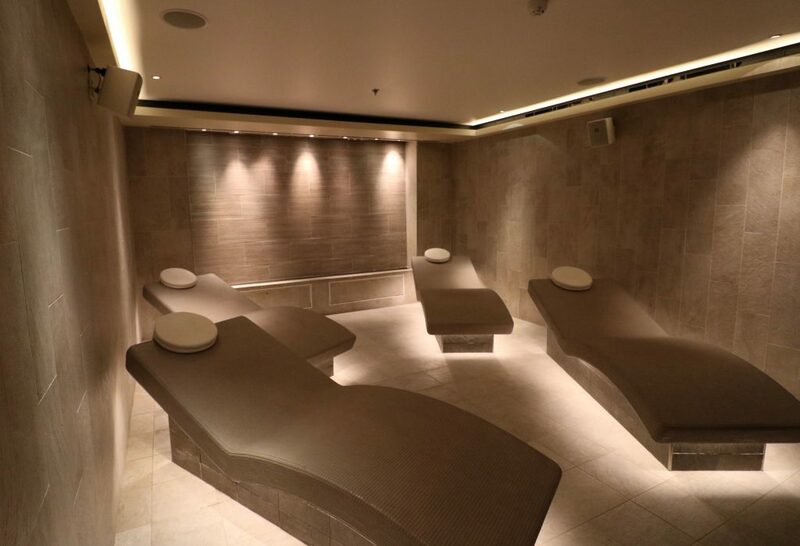 The spa area offers a thalassotherapy pool, cold plunge pool and cold bucket shower to cool in. For warm comforts there is a proper Nordic sauna, but also a steam room. There even is an actual snow grotto. Just so that you can do the traditional Nordic bathing ritual of bathing in heat followed by rapid cooling, in various forms. 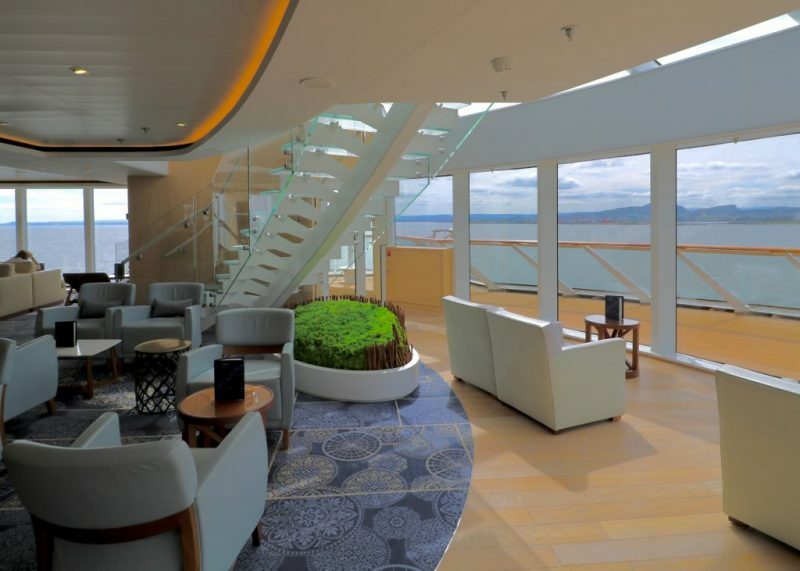 But deck one isn’t just all spa and the Living Room. It also hosts themed dining venues. 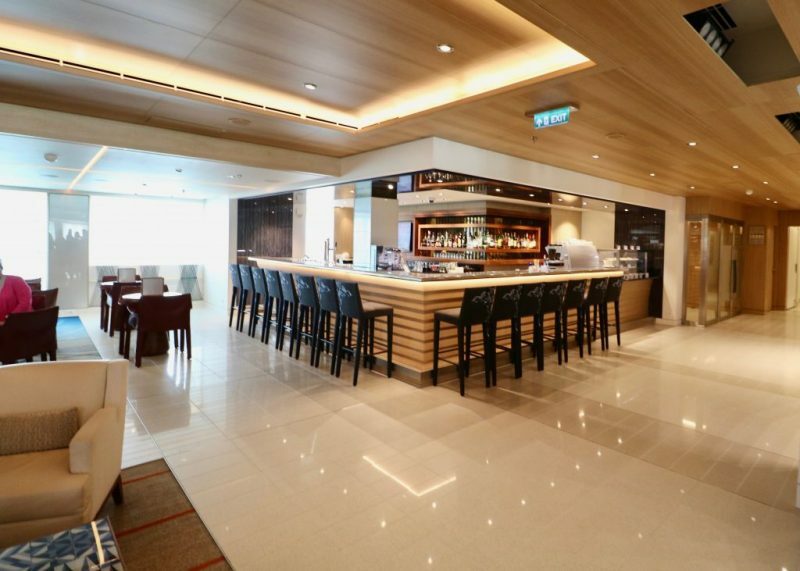 The two specialty restaurants onboard which are included in your cruise fare are located here. The number of visits you are entitled to depend on your stateroom class. 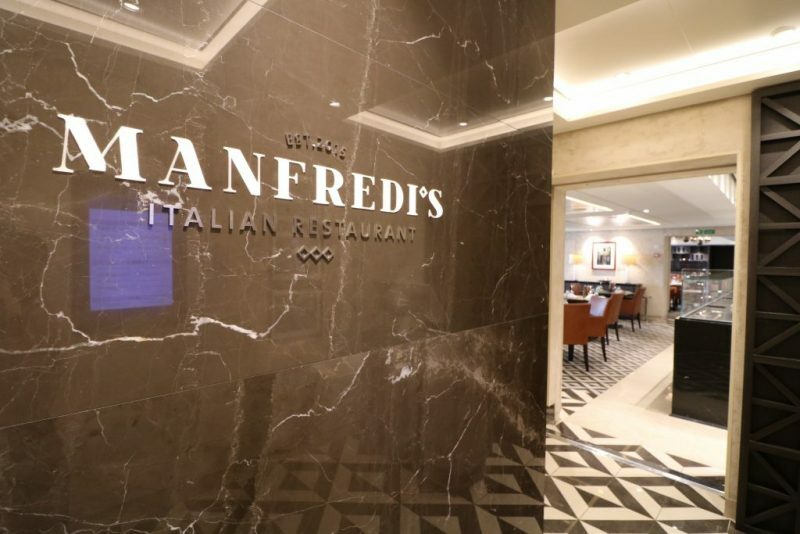 First of these specialty dining venues are an Italian themed Manfredi’s. 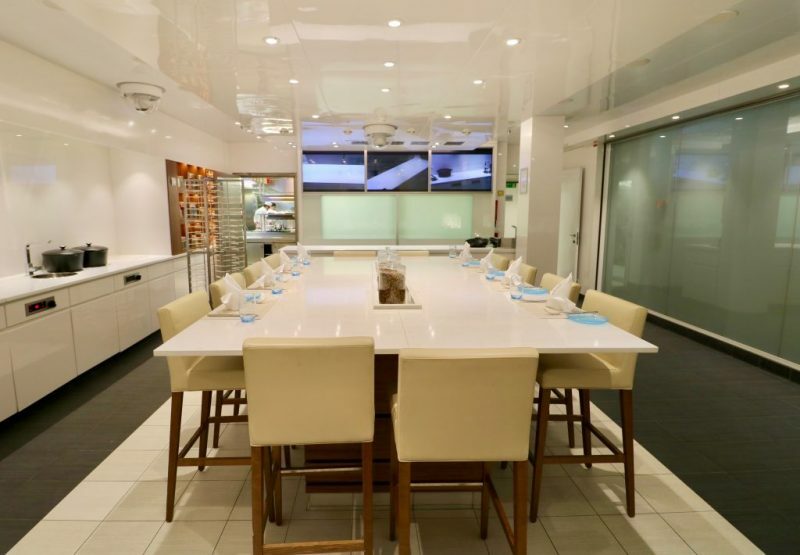 The second specialty venue included in your cruise fare is The Chef’s Table, which offers a 5-course menu that changes every three days. I am in love with the cosy, living room interiors! At the far aft, at the back of these two specialty restaurants, is a fascinating ‘excursion experience’ dining venue The Kitchen Table. It provides a two-part culinary tour, starting in the morning with an excursion with the chef to the local market. There the chef will teach the excursion group about the local produce and cuisine, and the dishes to be prepared later. 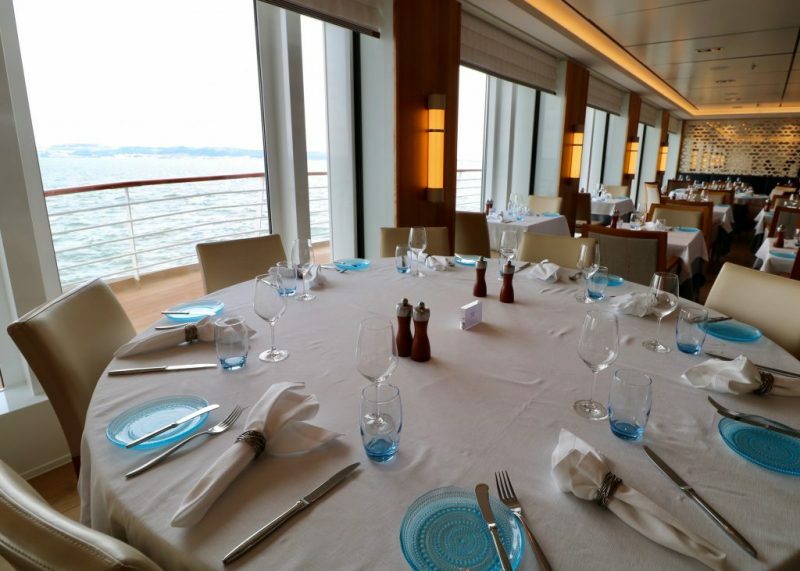 Once the ingredients for the dishes are purchased, the group returns to the ship to prepare their own dinner with the chefs’ guidance later that evening – or one can just observe them prepare. Upon arrival at The Kitchen Table, the sommelier greets everyone with champagne and throughout the meal, he or she will educate the group about the wines that have been paired for the food. A foodie’s dream – not so much for a vegans but I can appreciate the experience. 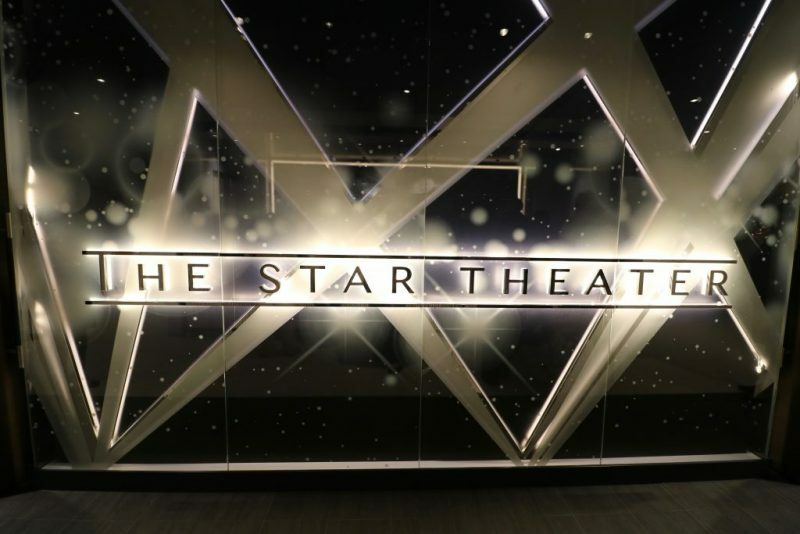 And I certainly love the look of the venue! 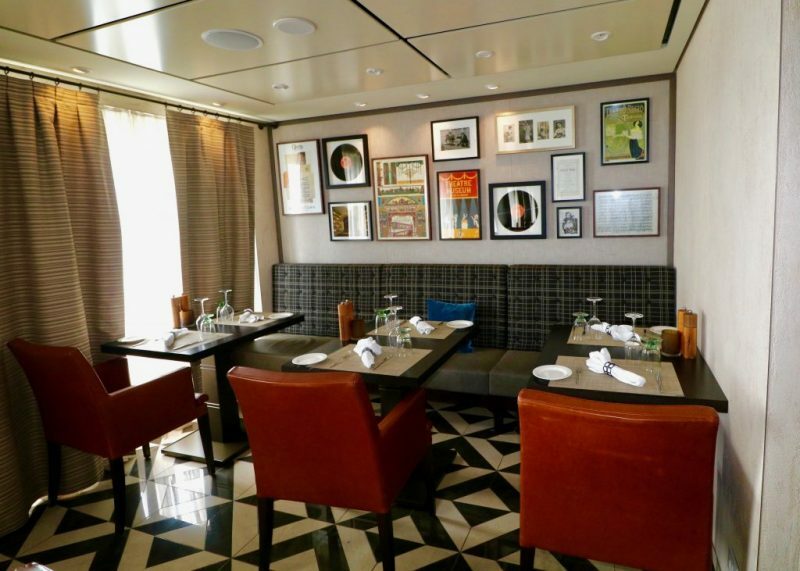 See CruiseReport’s excellent review of their excursion, wine & dining at the Kitchen Table here. 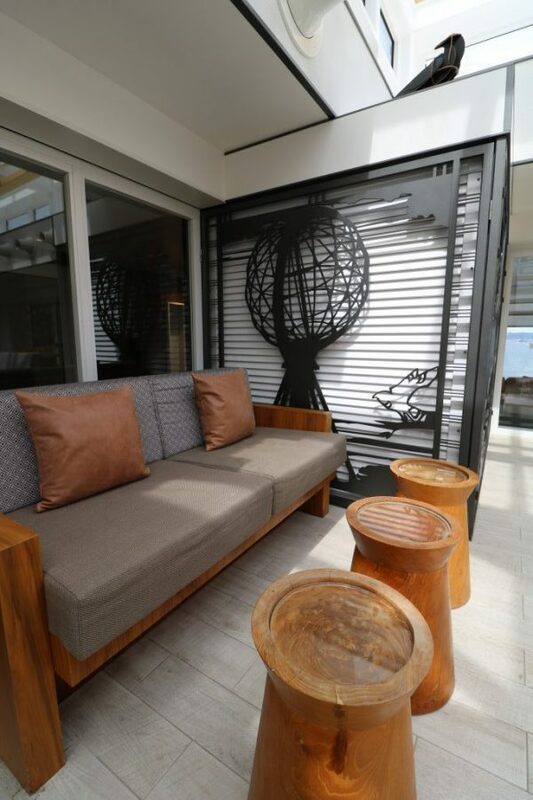 The deck 2 above hosts the mezzanine level of the atrium with further Living Room seating. 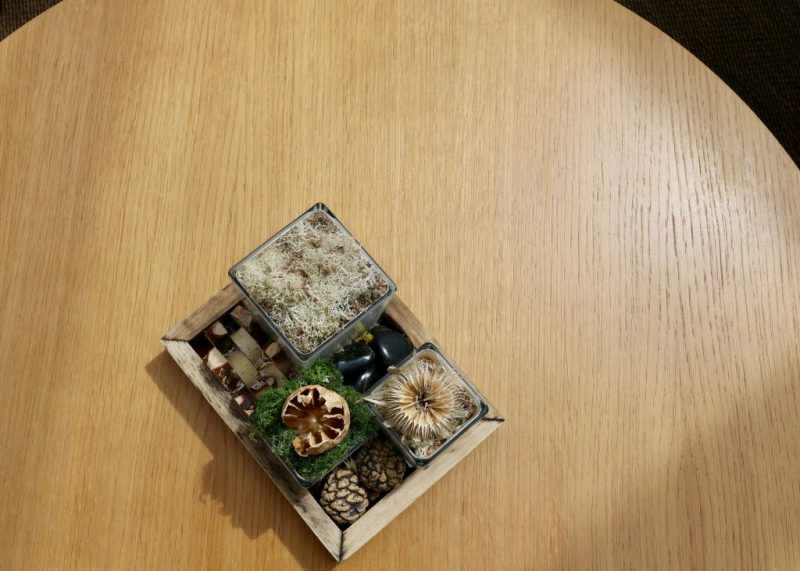 Interiors are equally elegant with Nordic touches such as using moss instead of flower arrangements as decorations. There also are electronic touch-screen gaming tables – not just cards but you can play air hockey too! Artwork from all over the Nordic nations is displayed with info for those who want to use the audio tour available on the Viking App. The ship’s nightclub Torshavn is here as are two shops, two small cinemas and the theatre for evening entertainment. 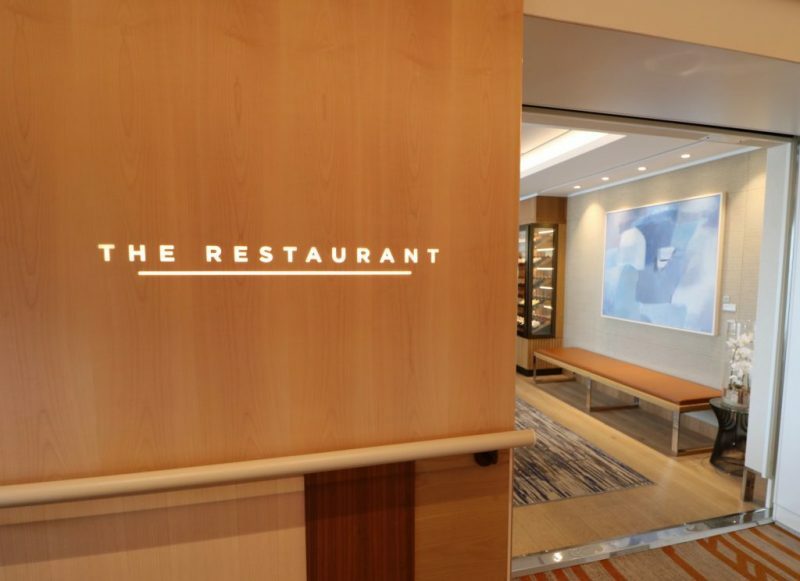 On deck 2 aft you also find the main dining room, or as Viking calls it: The Restaurant. Beautiful seating like everywhere else, even the hand sanitiser units are unintrusive and won’t disrupt the aesthetics of the venue. 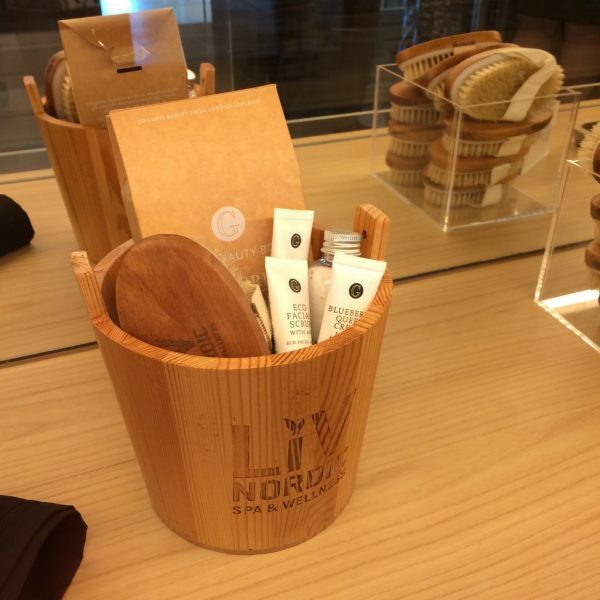 I was especially excited to see the premium Finnish glassware by Iittala in use here. 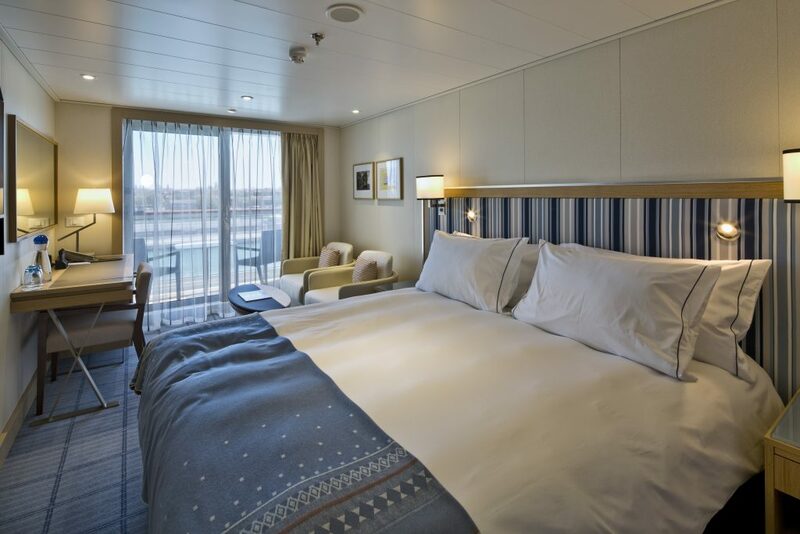 After four decks of different veranda staterooms and suites, deck seven is where rest of the beauty is hidden. Far forward above the bridge are two more beautiful venues. There’s Mamsen’s…aka Mum’s, a Norwegian deli cafe. It is open for breakfast, lunch and snacks at other times. Mamsen’s is named mum’s as it serves dishes from owner Torstein’s mum’s cookbook. Even the china used here is reproduced to look like the dishes mum Hagen’s old tableware. 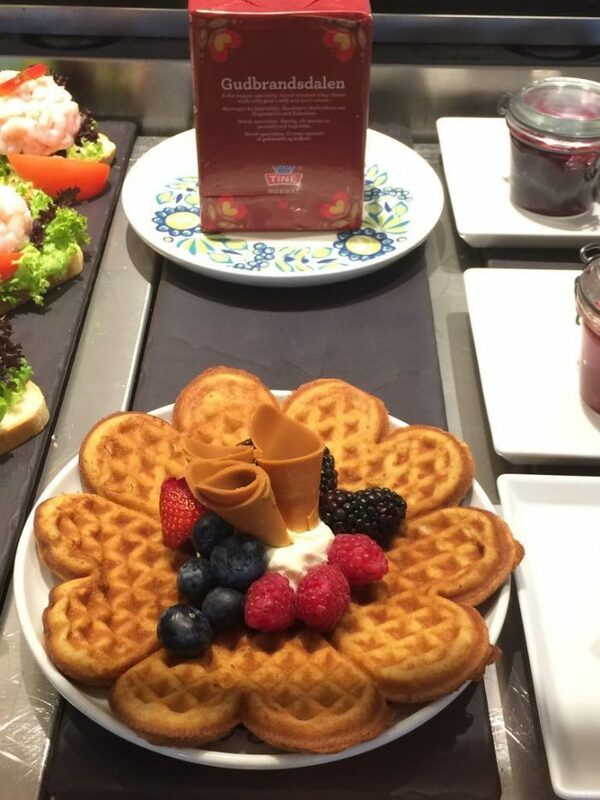 Traditional Norwegian dishes, including Nordic open sandwiches and waffles with various toppings… they don’t have a vegan version on the menu, but I am convinced they would certainly try if I took a good recipe with me for them to use. 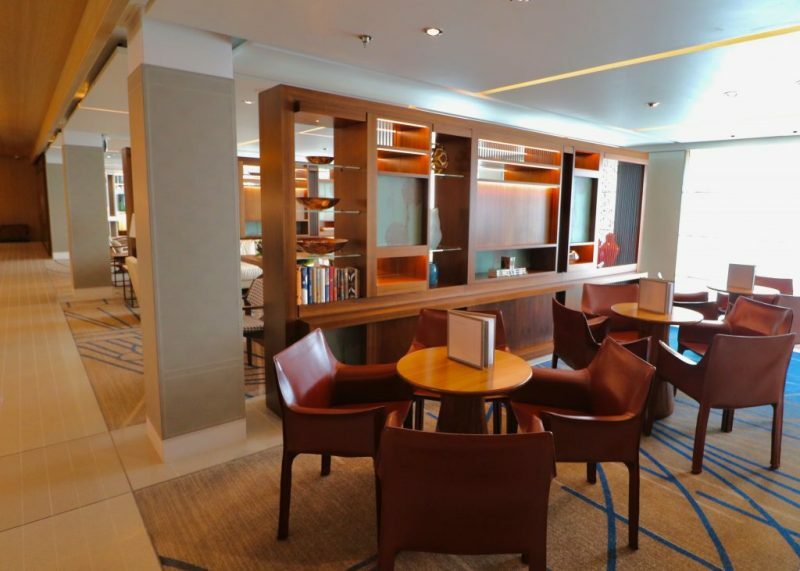 Past Mamsen’s right at the front of the ship you will find another bar lounge – with the best views over the sea. 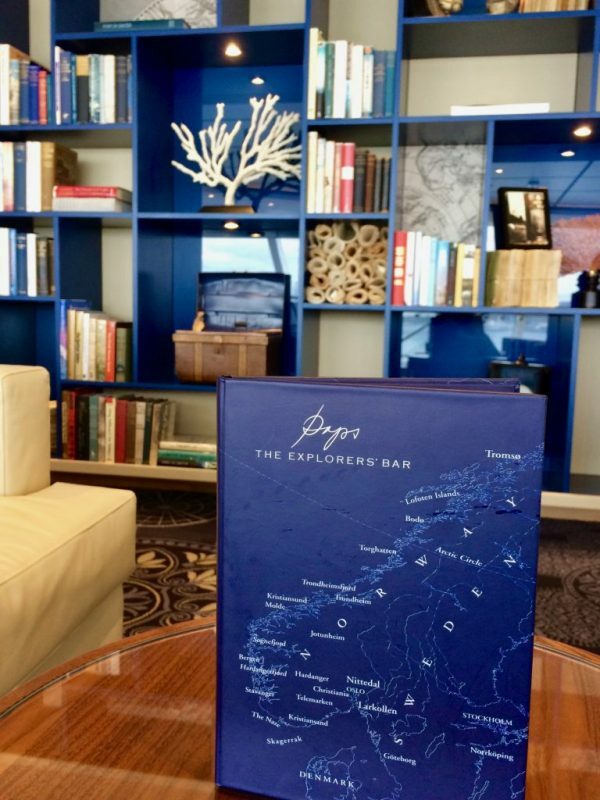 Explorer’s Lounge is like another ‘Living Room’ but Expedition themed. It is a relaxed, more colourful two-story lounge with comfy seating. There is a further selection of books to enjoy upstairs while downstairs area hosts a bar and has daily entertainment. 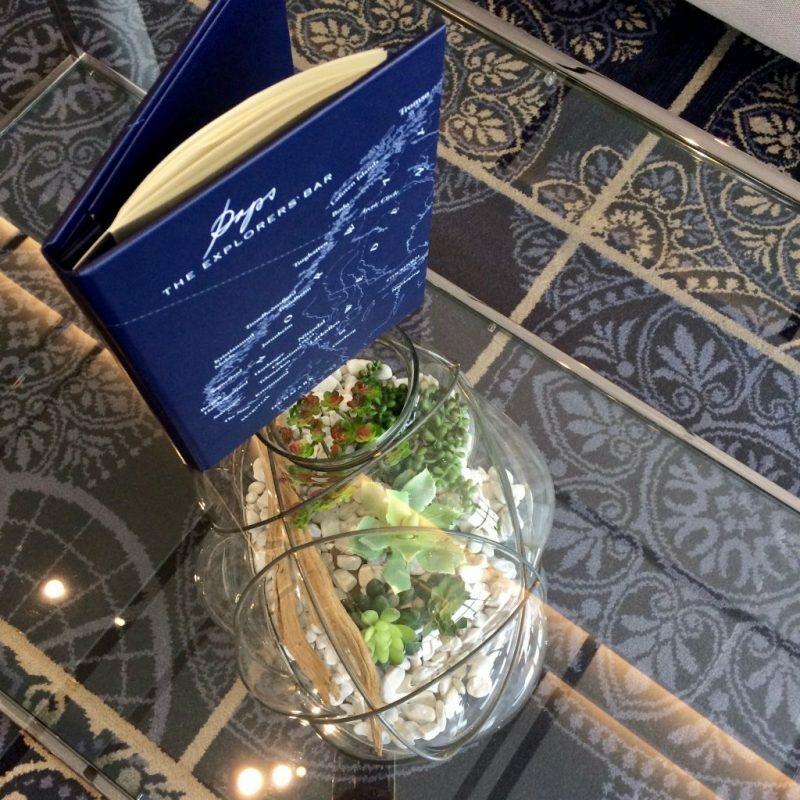 Midship hosts the absolutely stunning Wintergarden. 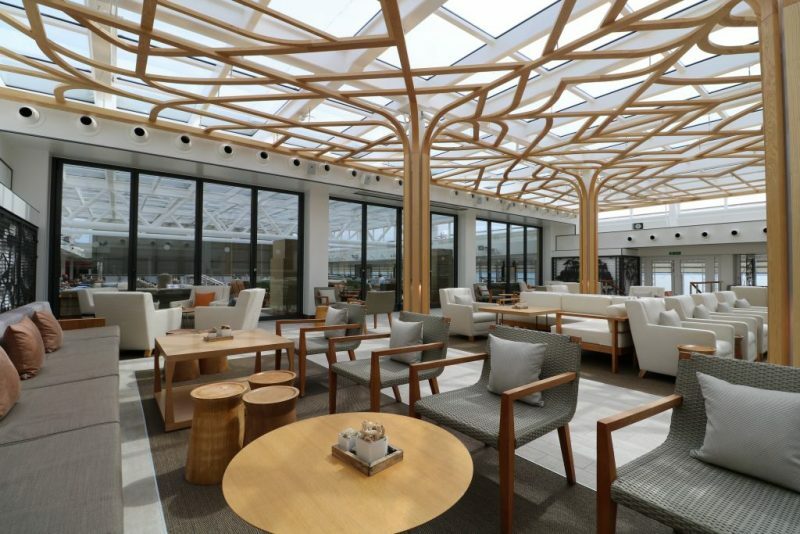 It is a clean, uncluttered light-filled space with beautiful tree-like pillars of wood. These trees weave a canopy over the guests who come here to enjoy afternoon tea, or just a little peace and quiet. I absolutely adored the decorative table centerpieces used here. No flowers, but lichen, moss and pine cones from the Norwegian forests & mountains. 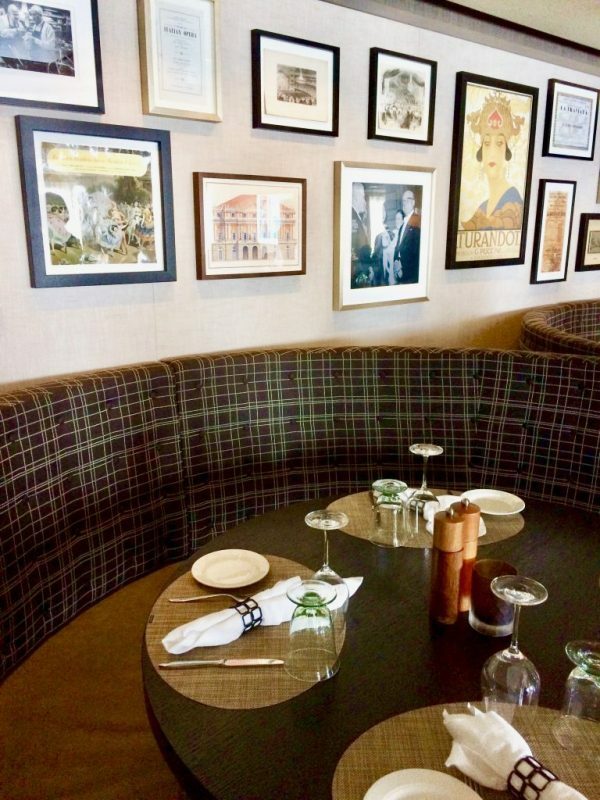 Seating provided in the Wintergarden is all light, contemporary and additional decorative pieces are well matched. 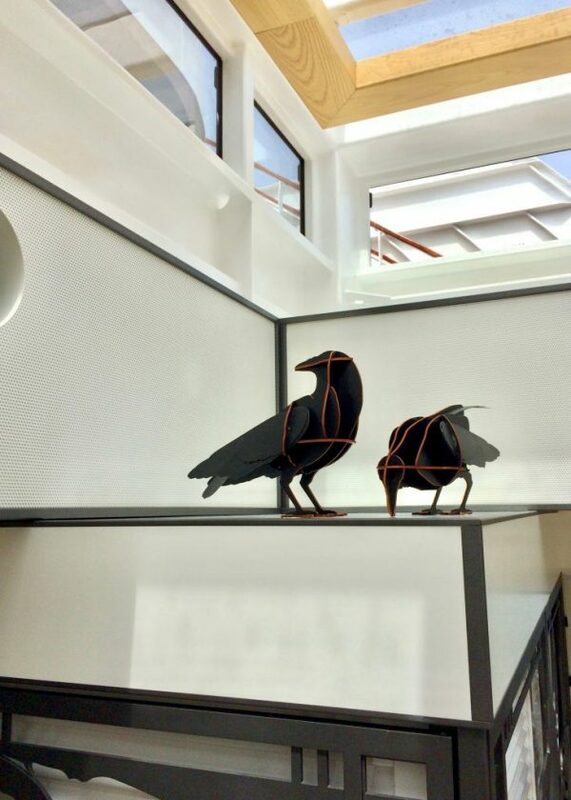 There are 3d puzzle birds sitting over a ledge, in the shadows of the ‘trees’. The tall stone vases host Nordic lichen rather than flowers. 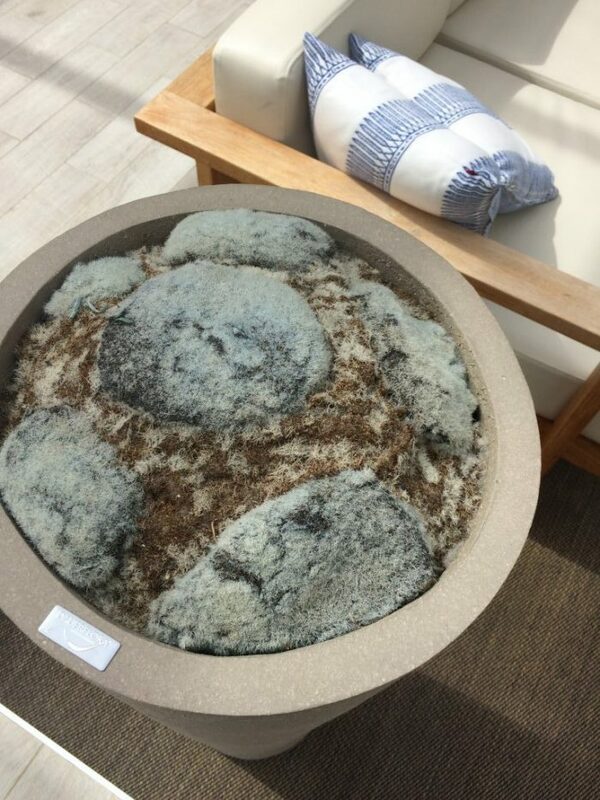 There is a calming stone water feature too. 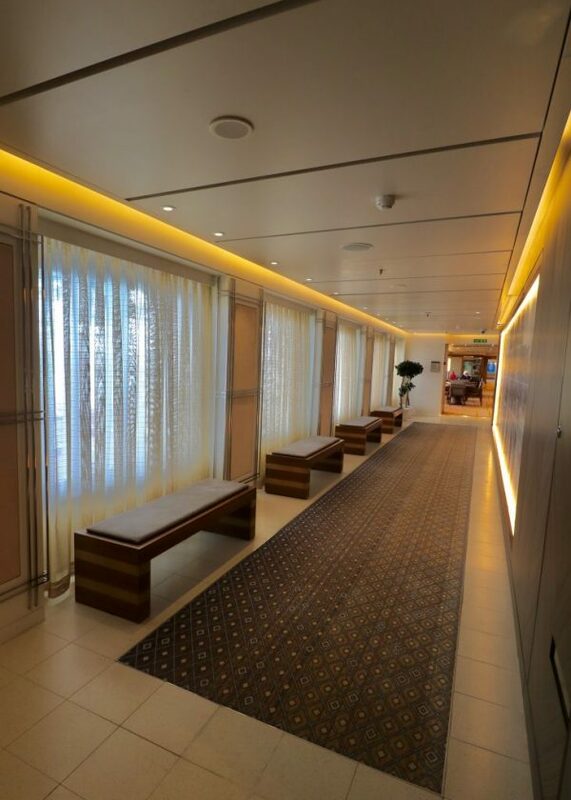 As you exit the Wintergarden, an adjoining seating space is found on both sides of the ship. The deck plan marks these as the Lanai. Beautiful line art ironwork is used here as dividers and points of focus, while still allowing as much light in as possible. Wonderful spots to chill with a book and enjoy the views over the port or sea. 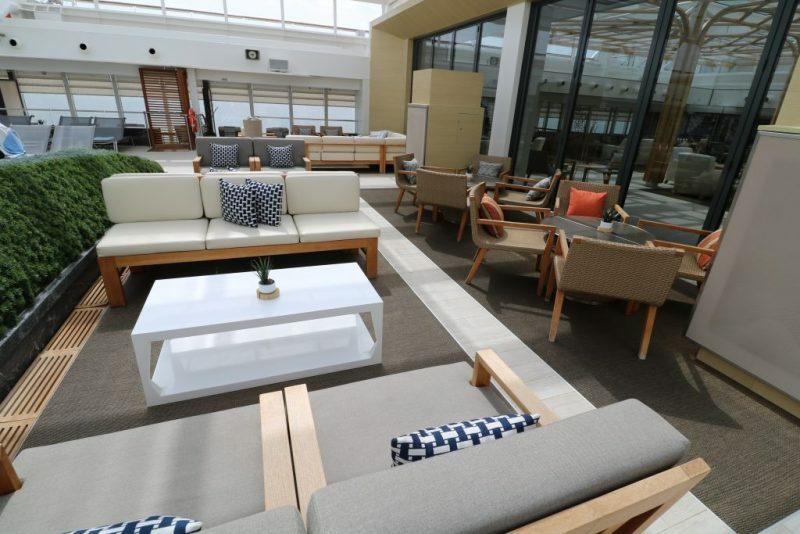 These two long Lanai lounges lead you to the Pool Bar and Pool Grill that serves a limited lunch menu. 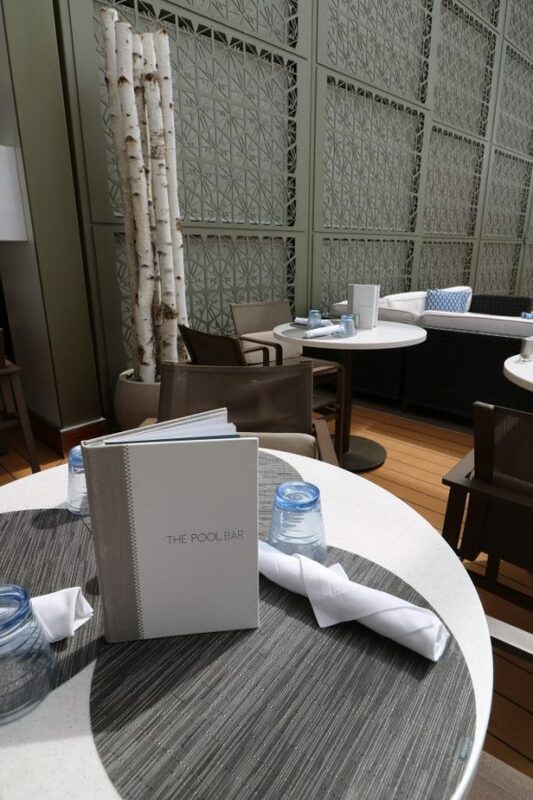 Nestled between the Pool Bar & Grill and Wintergarden is the retractable-roof pool (which was on during my visit, as Newhaven was rather cloudy). 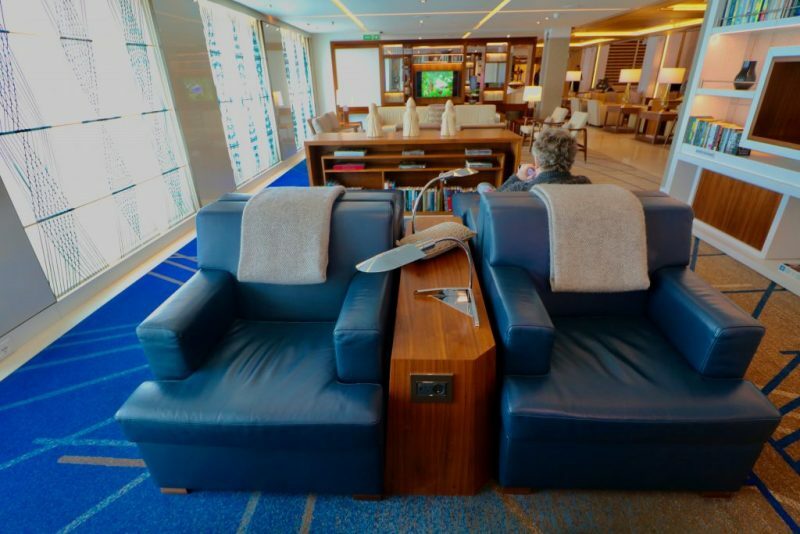 A range of seating is available, traditional loungers but more comfortable sofas too. 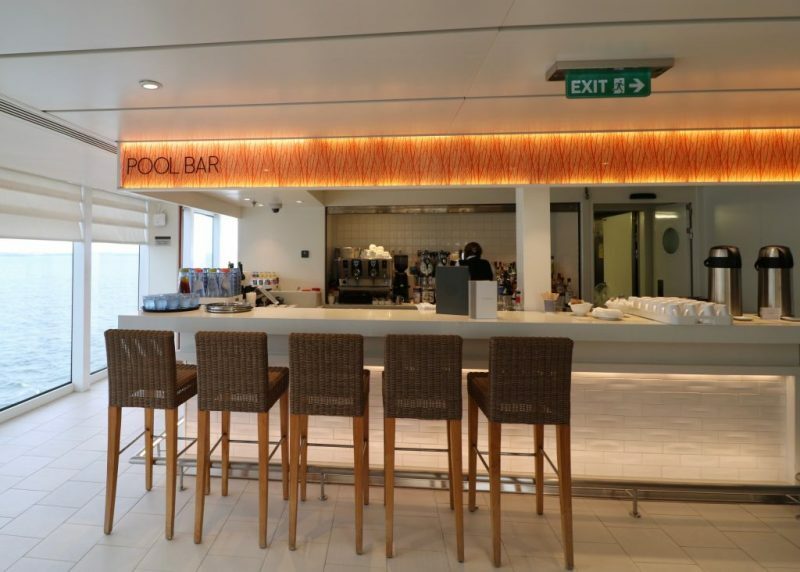 There is another pool onboard too. A rather more exciting one, in my opinion. It is an infinity pool, located outside (obv) right at the back of the ship. You can access this beautiful pool and the adjoining jacuzzi via the buffet. I know my cloudy shot of it won’t do it justice so I might need to have a PR photo of it to show too. Heavenly! 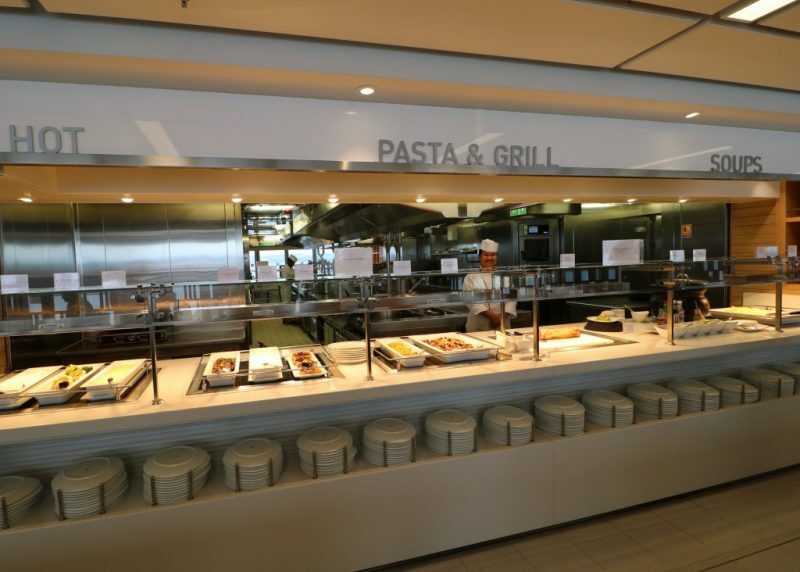 Buffet dining on Viking Ocean Cruises? Between the two pools is the ship’s buffet restaurant called the World Cafe. There are two lines, one of port and the other starboard, and the galley is visible between the two. Even in the World Cafe buffet, the tables are set for diners much like in the other dining venues onboard. Just like in other restaurants, the tables are laid with placemats and cutlery. The difference found here is the use of disposable tissue napkins. Instead of glassware, durable plastic tumblers are used. The blue ones appear to be near copies of Finnish designer ‘Aino Aalto’ glasses by Iittala. 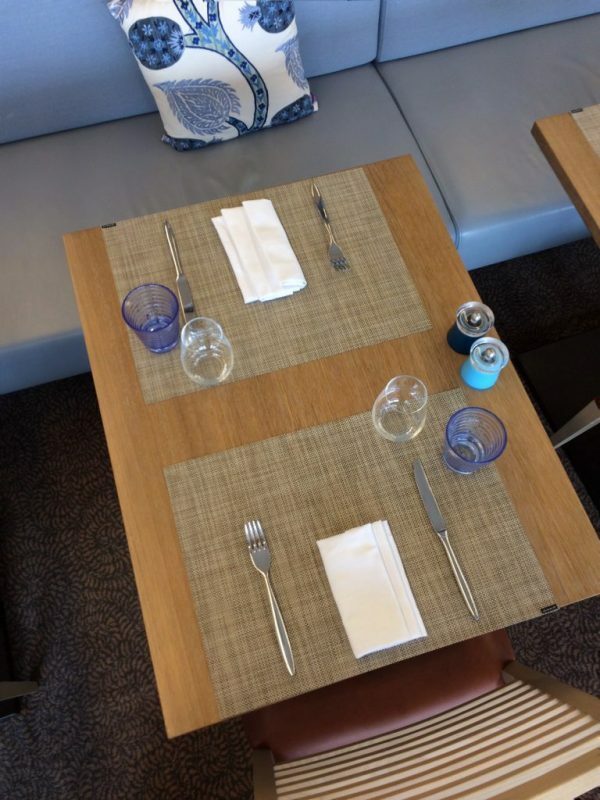 Like in the Chef’s Table, there are decorative scatter cushions on seating for comfort and colour. The attentive staff members walk around taking drinks orders from those dining in the World Cafe. You don’t even need to fetch your own drink, though a self-service juice station is available. The Aquavit Terrace outside World Cafe buffet has some dining tables to enjoy. Cloth napkins are used here, presumably for weight, to stop paper tissue flying off to the sea. World Cafe has a gelato station where on my visit day one flavour was dairy free for me to enjoy for dessert. There is one more bar venue in the far aft in the World Cafe, serving the restaurant and the Aquavait Terrace outdoors. A must venue for anyone enjoying alfresco dining. 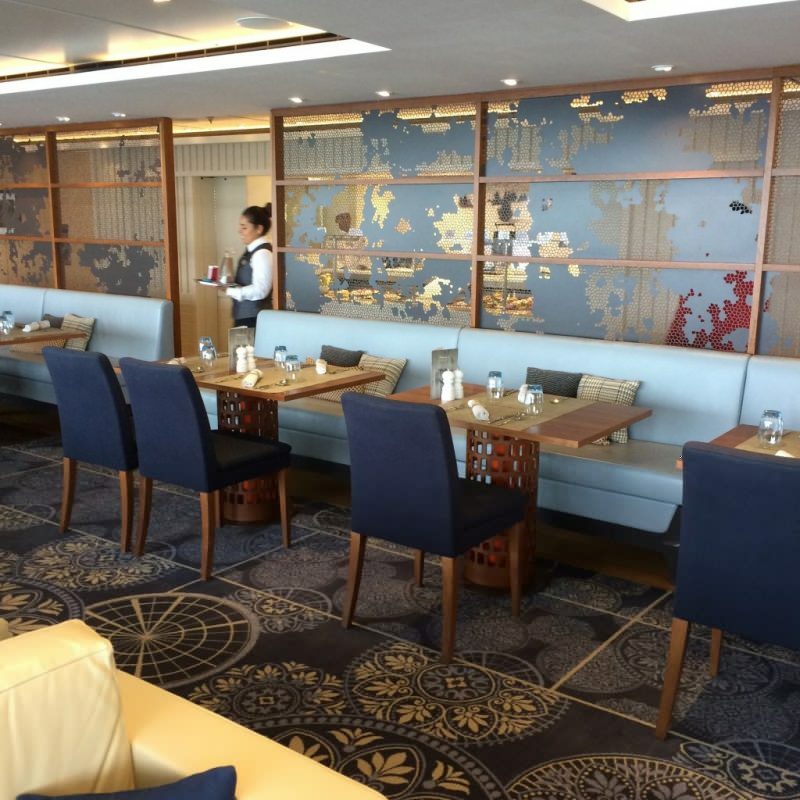 Every bit of the ship has delightful little interior features.. even in the buffet. 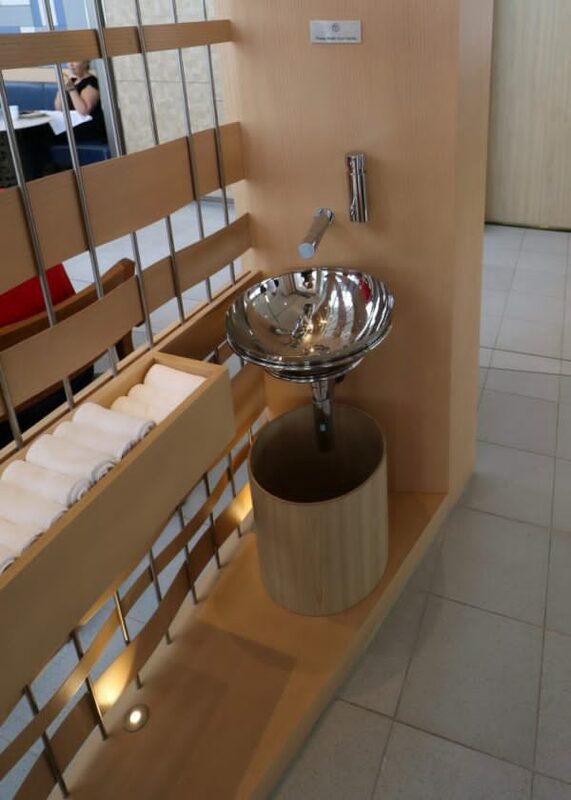 The Viking design masters have outshone others again, with the most stylish handwash station in the World Cafe as you enter from the terrace pool. 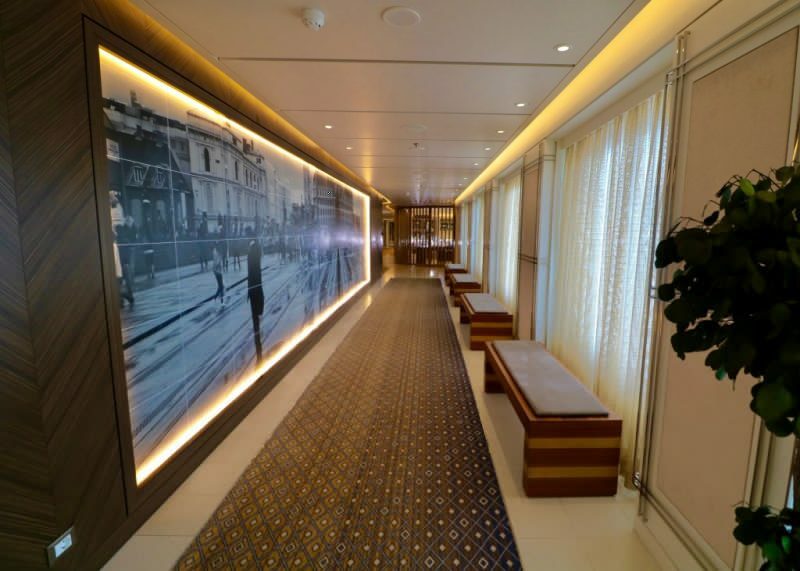 As Viking Sea was sailing at full capacity, I was not able to see any guest cabins/staterooms. 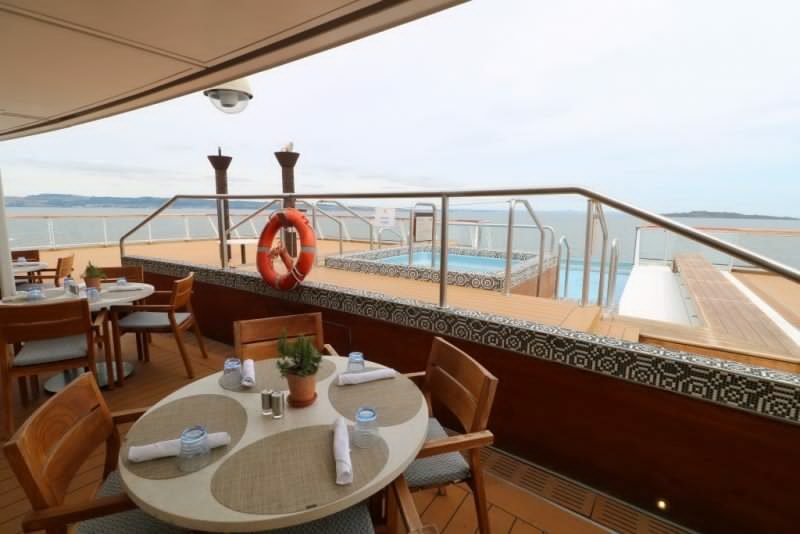 All staterooms onboard are verandas (balconies) or above. 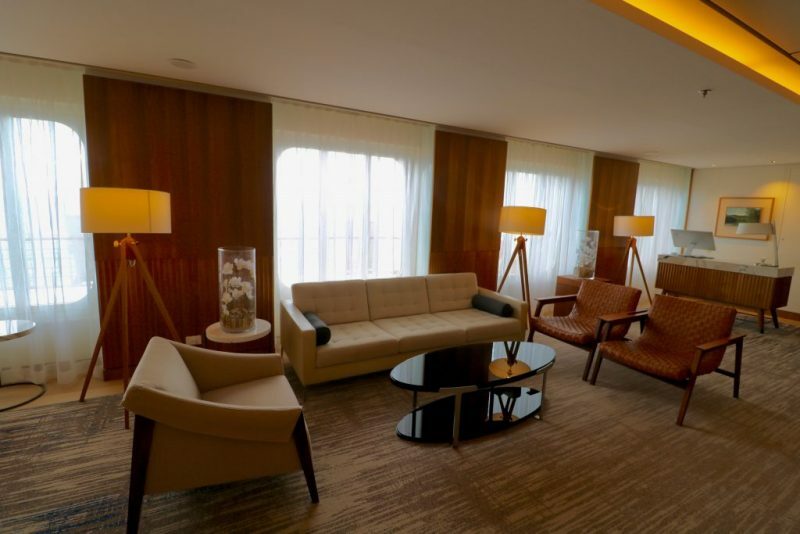 From the press image given for me, you can see that the Nordic feel of the public areas is replicated in the guest staterooms. 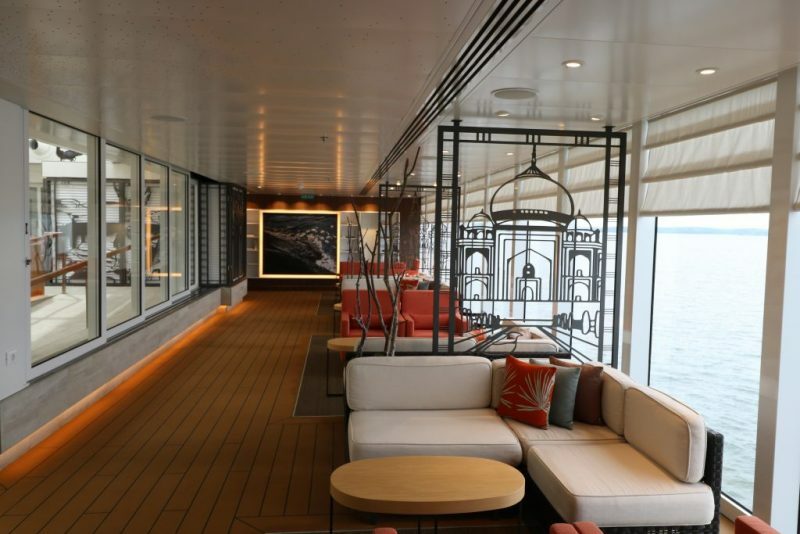 Viking Ocean Cruises have helpfully provided a 360degree tour of their ships on their website, including the stateroom categories. You can see it here. 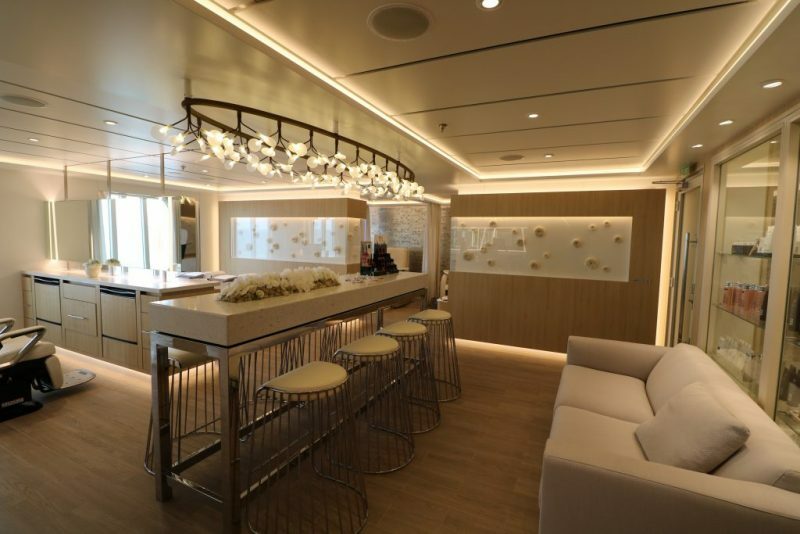 Who are Viking Ocean Cruises anyway? Not familiar with the brand? 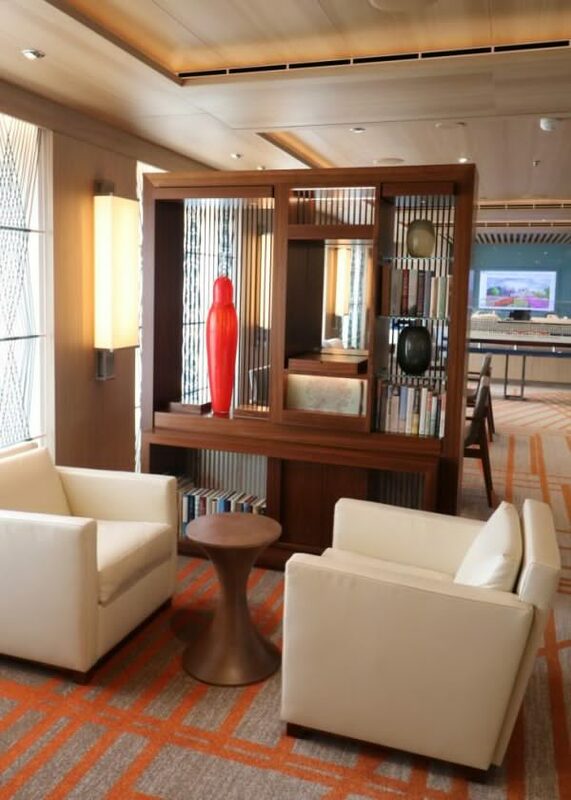 It could be because Viking Ocean Cruises is a newcomer to the premium cruise market. 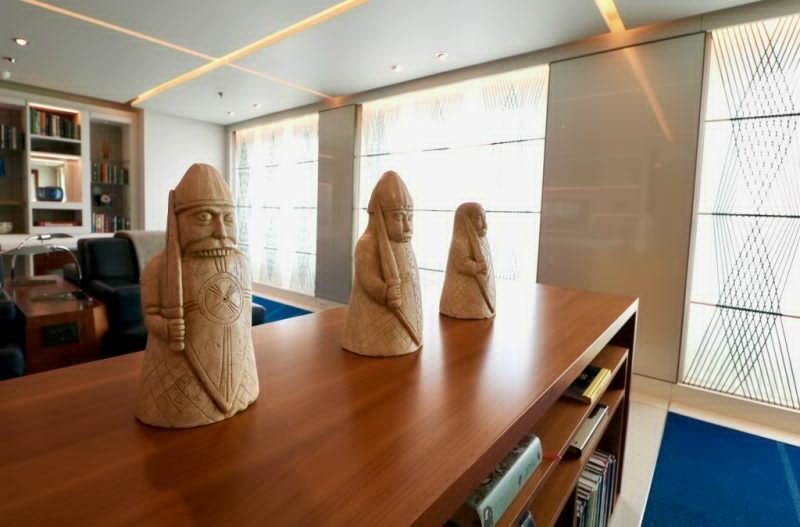 Even the Viking River cruises, the original brand, is a relative newcomer to the trade having been launched in 1997 by the Norwegian owner Torstein Hagen. 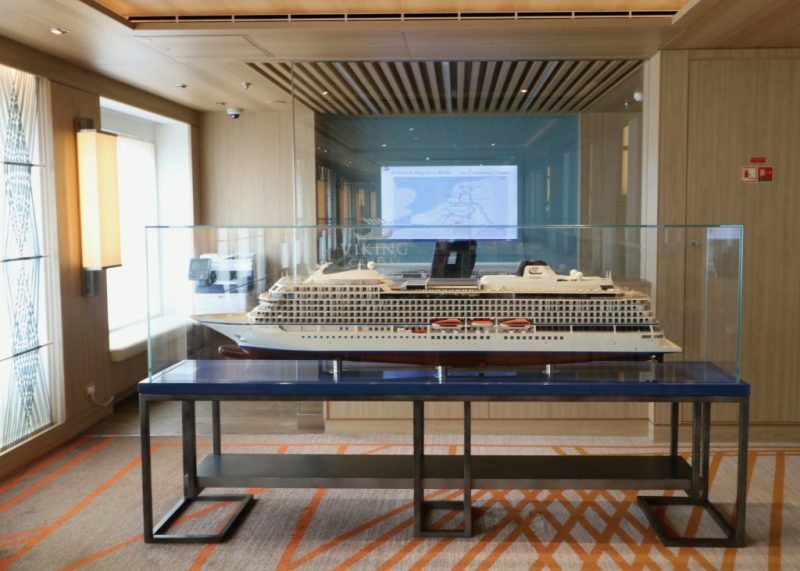 As the river fleet grew in size and popularity, the Viking Ocean Cruises came to be in 2015 with the launch of the first of the ocean ships: the Viking Star. Viking Orion is the latest ship to join the fleet of five sisters this year. 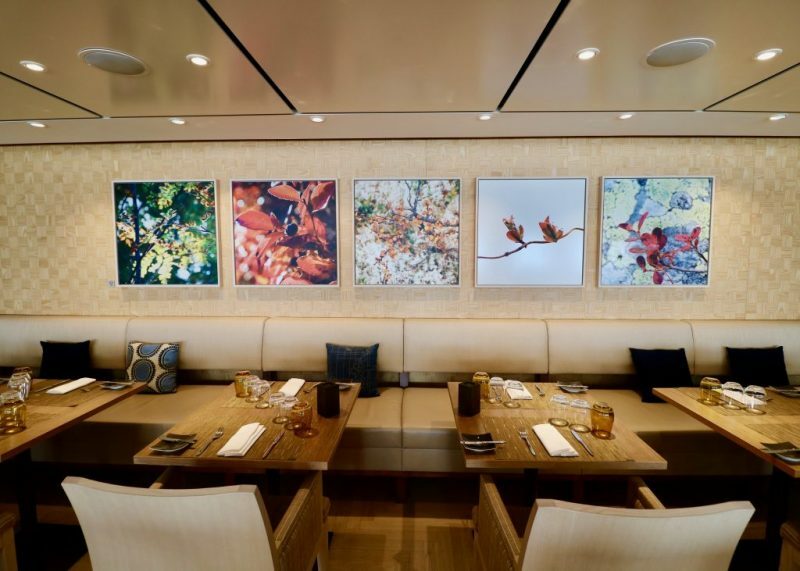 All of the Viking Ocean Cruises ships are small and host only 930 guests at max capacity – small compared to mass market cruise lines who easily carry anything from 3,600 to 6,700 passengers. And although Viking Ocean Cruises are classed upper premium/luxury, they don’t insist on rigid dress codes like few other brands do. Elegant casual is what they ask for… no ballgowns and tuxedos required here. Sound perfect to me! 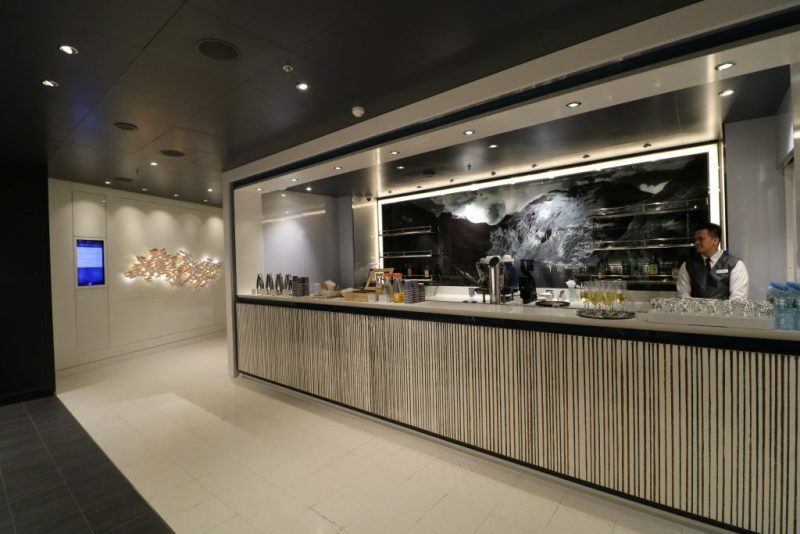 Would I book Viking Ocean Cruises after my visit? From all the promotion on press and online, and by friends who have sailed with Viking, I knew the five sister ships on the fleet to be alluring. My visit confirmed that Viking Sea and her sisters are floating havens of effortless Scandinavian chic. The extremely young fleet is quietly luxurious, full of pieces from various Nordic design houses, yet never brash or pompous. Always light, airy and elegant. Service onboard was attentive and my experience in the buffet as someone with dietary needs was excellent. Over lunch, spoke to both the restaurant manager and the head chef about catering for dietary needs. 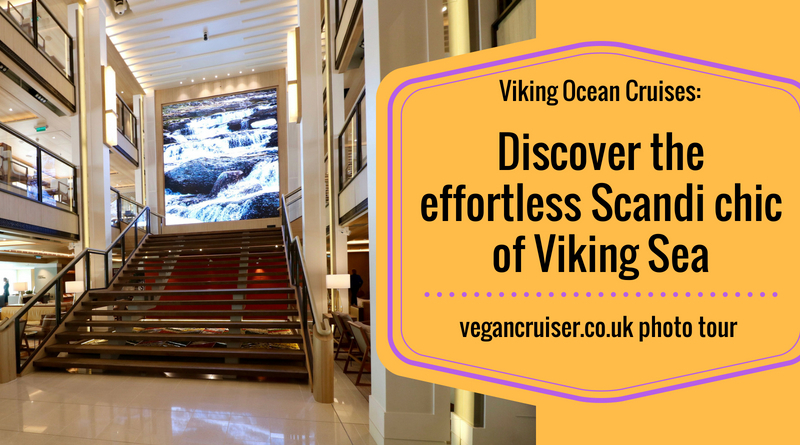 Am confident Viking Ocean Cruises can cater for vegans too, even though there is no ready-made vegan menu. 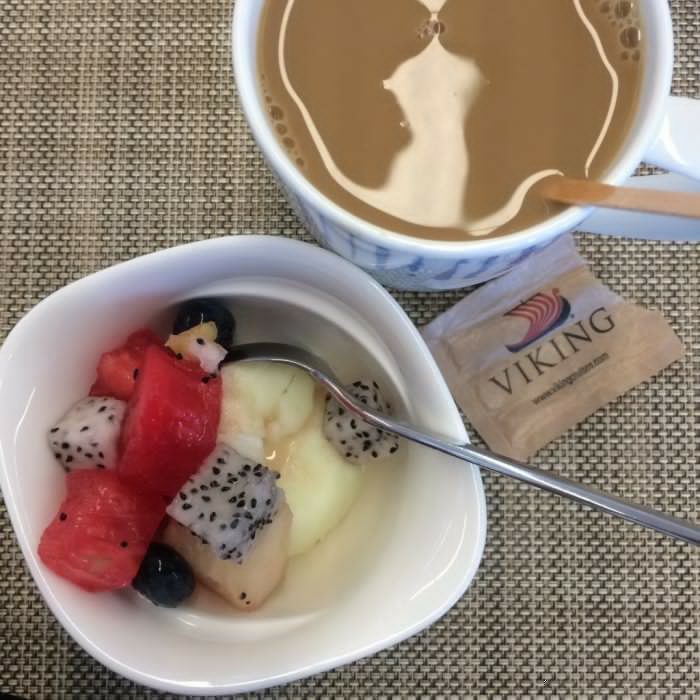 I’ll have a separate ‘vegan on Viking’ blog post out soon, with more information I gathered onboard Viking Sea. 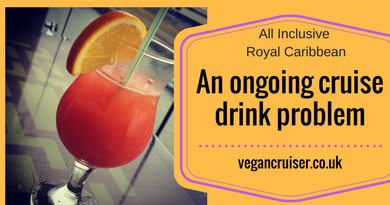 Plus, I have a reader reviewing vegan catering on a Viking River Cruises boat. 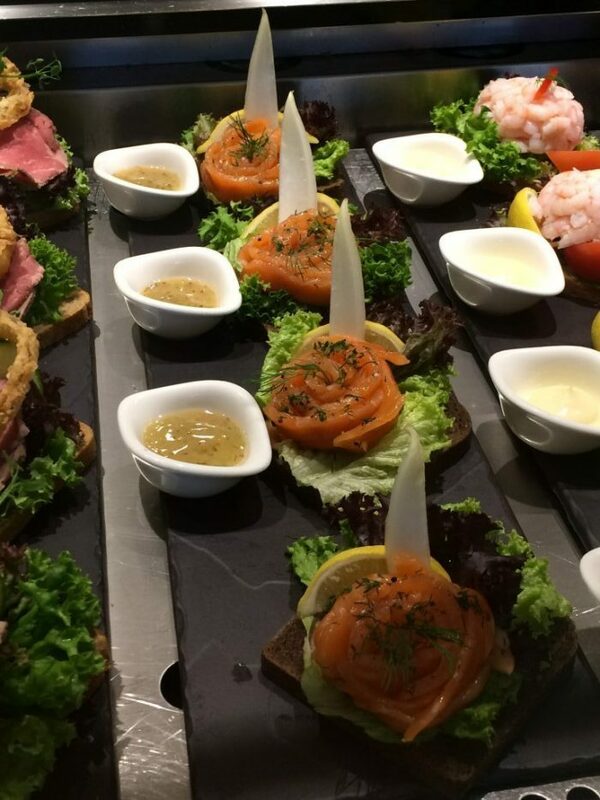 If you are a reader with dietary needs, do come back for those if you’re Viking-curious! 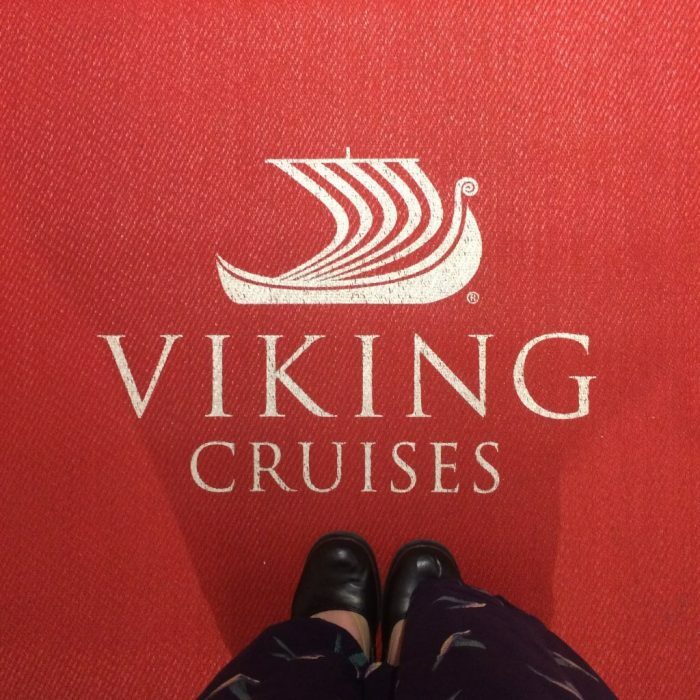 I did not just love Viking Sea, I fell in love. One rarely, if never, wants to leave a cruise ship but this one was the toughest departure yet. I’m certain everyone will feel that way once onboard. 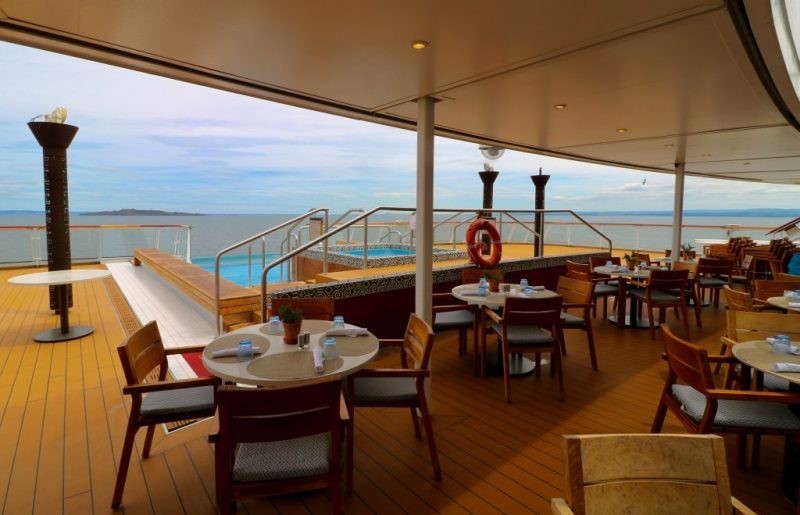 And if my photos aren’t enough to convince you to give Viking Ocean Cruises a go, perhaps this helpful Youtube ‘pocket guide’ tour by VisitWith.Us will do just that. Any comments and questions, I’d love to hear from you! ← Miatui Mini Jen travel handbag – fab faux-leather arm candy for cruising! The library is my favourite thing everrr! So lovely. I truly cannot believe how luxurious some cruises are, I can totally see how you fell in love with this one. This looks AMAZING! Probably my favourite yet. I love all the Scandi decor and just everything about it, it looks lovely. I would definitely want to stay here. Oh my gosh this looks absolutely amazing! I’d love to be on this cruise right now! 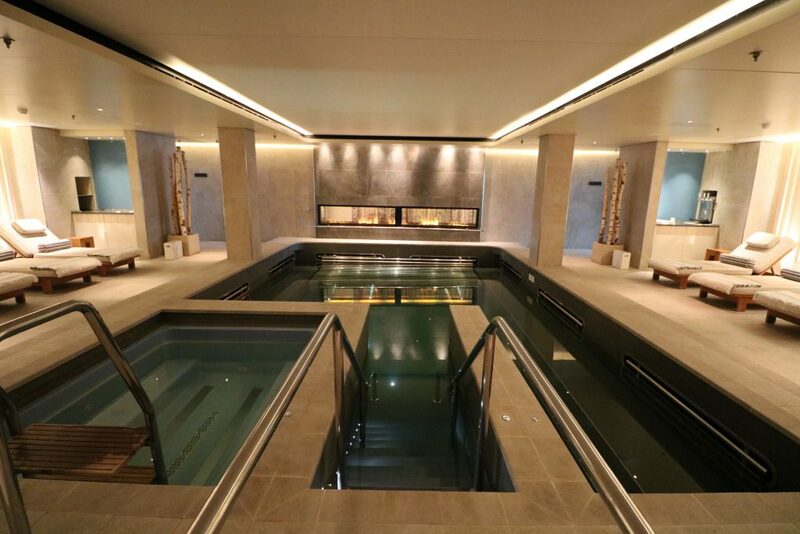 The spa is truly stunning, you captured it so well! I also love the Wintergarden, what a beautiful design.